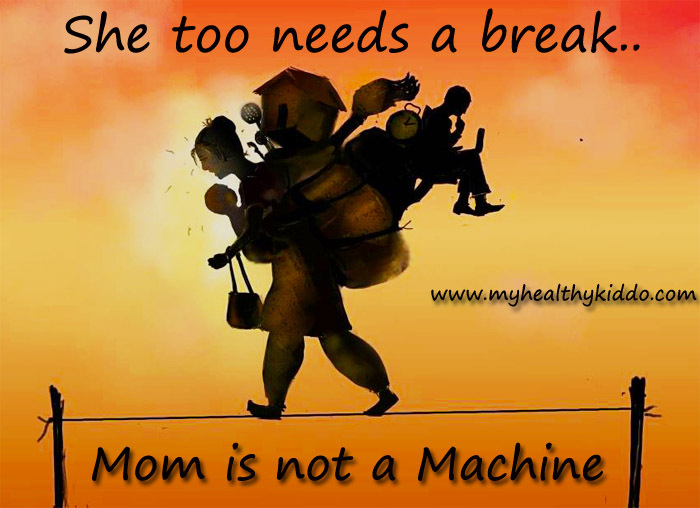 Mom is not a machine! Happy Woman’s day(March 8) to all 🙂 Its my prerogative to bring this topic today. Female freedom is an age-old topic and many of you might think this as irrelevant in this modern era as women have already come out of the kitchen to conquer the world. If you explore deeply, she has not yet come out of the kitchen! Along with her kitchen work, she has taken additional responsibilities to pursue her interests hidden inside her apron strings. Mending her career, she started supporting the family financially. She is actually, over-loaded ! Firstly, I thank god for have gifted me an understanding hubby with lovely in-laws. I have seen/heard the miserable lives of many women, who have not been gifted as in my case. This penning is an initiative to shout out their inner voice, seeking for empathy and hoping for a change! Though we are in 21st Century, where old-age homes have become more popular, still there are many women who respect the family values and mend the family web meticulously. This post is dedicated to those women. But, do the families realize/respect/acknowledge the multi-faceted role she plays ?? In a joint family(in most cases), a male cannot enter the kitchen even if he has the intention to help her. Kitchen is solely copyrighted to women. In many houses, still women(working women are not exceptions) have to cook and serve too. Honourable males enjoy their gender preference and remain as couch potatoes at home. Women in nuclear families who don’t have helping husbands face same problem. From dawn to dusk, she works .. Her work place might vary, but she toils round the clock. She appeases everyone except her stomach. The number of chapathis she eat is not dependent on her hunger factor but depends on the leftovers. Still in many joint families, males should eat first and females should eat the rest. These are unwritten laws. Working moms are too pity. They long for sleep. If the baby cries to sleep, the whole family will be sleeping except she, who will be making the baby to sleep with the last bit of energy that she has to survive for that day. She will be the last to sleep and the first to getup. Fighting for woman’s welfare, we have eradicated many old habits like keeping her out of the kitchen and other household chores on those 3 days of the month. Our feminists voiced against it and got her the freedom to enter the kitchen on those days. As an aftereffect, her 3 days rest too was trashed and she has been burdened on those days too! She is not a child-bearing machine .. She is not a salary-less maid .. She is a wonderful human and a determining woman ! She too needs ample rest , nutrition & special time for herself. It is insane to expect change from the older generation. But, as a responsible husband, please open your eyes and see how she toils for you and your family. How many males are ready to clean your baby’s pooh, when your wife is eating/cooking ?? Just don’t categorize womanly works.. You are her life-partner and you have the responsibility to share her work. If your parents do not allow you to share, try to make them understand. If not, just ignore them and keep helping her and sooner than later, they will adapt and accept the change ! Pls do not exploit her.. Share her work and gift some precious time for her.. Respect womanhood ! Thank you so much.. Keep following..